The plastic gods above know that, in the pursuit of the all-powerful dollar, toy companies have come up with some oddball action figures in their time. Almost every successful toy line reaches that point of over-saturation and cranks out some of your favorite heroes in get-ups you never asked for. Ranker has collected many of these abominations in this list of inexplicable action figures. Sure, every major character from your youth got a lame variation - everyone from He-Man, to Batman, even the Ninja Turtles outlived their merchandising lines and the people behind them had to come up with something. Other times, well, toys just started out bad. It's hard to imagine the people even wanted some of these when they originally came out. So go through that old box in the attic and maybe throw some of these out. I can't make a joke about this, so just avert your eyes and pray for a better future. What's more embarrassing than having the buy an accessory separately? When it's just a mangled cow torso for your Rocky-figure to hit. Is there a beloved franchise that Todd McFarlane's toy company didn't try and perv-up? Feast your eyes on Dorothy from The Wizard of Oz. RIP Innocence. 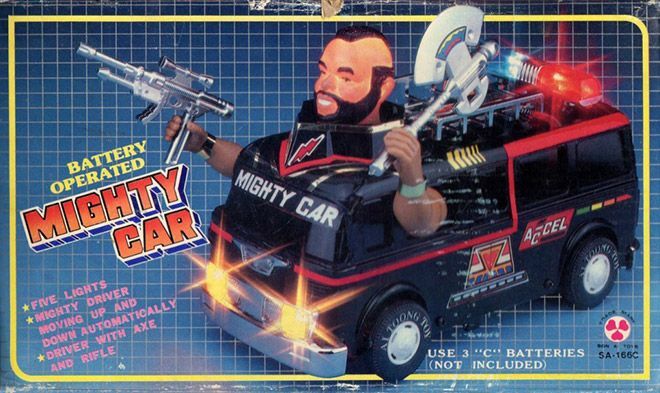 This horrible abomination is what happens with the A-Team van falls into a vat of toxic waste with Mr. T behind the wheel. Who gave that mutant an ax and machine gun?